Realities of Creation Our New Book released on May 1st, 2016! Because we are multi-dimensional beings, we have the ability to create in several, if not many, different realities. We aren’t just limited to the physical world anymore. Truly we never were, but we just weren’t able to expand our minds to be able to see that. We had no frame of reference. The past is gone, taking with it all thoughts of playing small. We have found that magic lamp, and we aren’t limited to just three wishes―we can have as much (or as little) as we can handle. This book is a toolbox, filled with ideas to help us move beyond our pre-conceived notions and limiting beliefs. The reader can take a little from each of the contributors and craft the method of conscious creation that best works for them―with consistency, ease, and grace! This book came about as a co-creation between the speakers on the popular Realities of Creation tele-summit. Each speaker contributed a chapter on their area of expertise― topics that they have been writing and teaching about for a while. If one particular author resonates with you, you can find more information on that topic on their websites. Our reality is changing and this book provides new information to assist you in your own path of conscious creation. Linda Minnick ~ Don’t Worry – It’s JUST Your Perception! This entry was posted in Blog and tagged #RealitiesofCreation, Jean Adrienne, Julia Griffin, Kathleen Kanavos, Laurie Huston, Leslie Amerson, Linda Minnick, Lynn Waldrop, Maureen St Germain, News for the Heart, News for the Heart Radio, Power of the Heart, Realities of Creation, Realities of Creation Book, Suzanne Strisower. Bookmark the permalink. 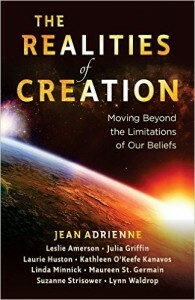 I just preordered Realities of Creation!! I’m such a fan of all that you do, Laurie. You are sincere and caring, intuitive and soulful — truly magical. And I’m sure your section in the book personifies all that you offer the world. I can’t wait to read the book! !